The Hathaway Maverick table tennis and pool table combination is a way to have two great games for the price of one, or even less than the price of many standard pool tables. It is a little smaller than the standard pool table at seven feet long and almost four-feet wide, and that can make a big difference in a home game room. The smaller size helps if space if limited, but it is big enough to feel like you are really playing the game. The pool table is red felt, which looks nice in about any decor, and the table itself looks stylish. 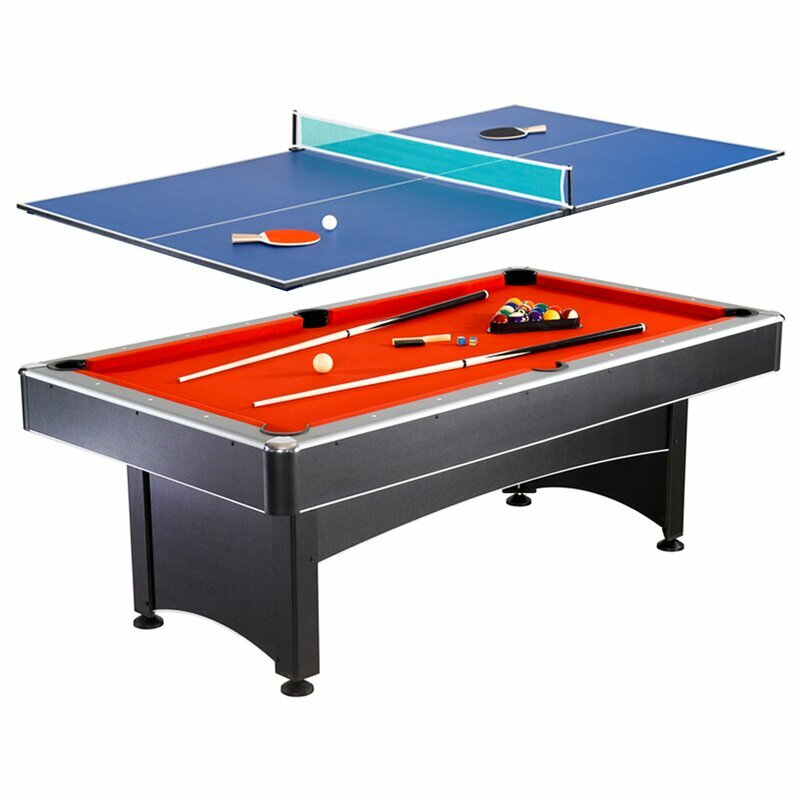 It comes with a table top assembly that is easy to install and turn your pool table into a table tennis game. Changing back and forth is easy and saves a lot of space. The combination game table comes with all the accessories to play pool or table tennis, such as cues and balls. Some assembly is required but it is not difficult. Table legs have levelers to make adjustment easy as well. This combo is reasonably priced and sturdy enough to give years of play. Pool table playing field 74 x 36 inches, table tennis playing field is 84 inches by 46 inches. The pool table is 3 feet tall, which is a nice balance between teenage and adult size. Table tennis surface easily installed or removed. Red felt surface for pool table. Silver laminate top rail with white inlay and chrome plated corner caps. Reinforced rubber cushions. Blake laminate outside panels, with black molded corners. Comes with all equipment to play both games. The Hathaway Maverick pool and table tennis table is a good combination of two games that will not take up a tremendous amount of space and it is at a reasonable price too. Smaller table is great for young people who are better able to play pool with this size of playing field. The table tennis board is easy to install and is stable enough to work well when attached. The table itself is very good quality. You can always add better accessories, so consider the table itself the foundation. It is easy to assemble. It is a little heavy at 250 pounds, but other than attaching legs, there is not a lot to do. The accessories, such as the pool cues or table tennis paddles, are of low quality. There seems to be a huge difference in quality between the table and the equipment. Pool cues are too light. They seem flimsy and that makes for poor accuracy when trying to make shots. It will frustrate people who play a lot, and will not help beginners get better. The table tennis board is also fairly low quality, but good enough to play on. It can be a little hard to handle because of its size, but it is not heavy. No ball return, just a slight inconvenience, but still it would be nice. The triangle for placing the pool balls does not fit snuggly, making it hard to set up the game on the pool table. This is a great addition to a family room with teenagers. The smaller size of table is ideal for children, but big enough for adults as well. It does not take up a lot of room, and you get two quality games with one table. Serious pool players, or table tennis players, will find the surface too small. if you need regulation size, this table is not for you. This is especially true if you use the accessories that come with the game. Adding higher quality ones would make the game playable for more advanced players. This table is great for family recreation and will fit well into most game rooms or garages. It is big enough to make the games realistic and ok for adults, and small enough for children to be able to use it well. The table tennis addition is a bonus, and it is easy enough to put on or take off to make that a nice advantage. The table tennis board is not the strongest of surfaces, but does not need to be. This combo table is affordable and costs much less than a lot of standard pool tables. The quality of the table itself is excellent and should last a long time. The only real downside is the equipment that comes with the table. You might be happier if you throw away the pool cues and table tennis paddles that come with the game, and buy some of better quality. Even if you do that, it is still a good buy. The quality of the table more than makes up for the less than stellar accessories. This is one of the best selling combination games on the market, so the makers are doing something right. This combination game offers good enough quality, and space savings, to a to make it a worthwhile investment in any family game room.